What I really enjoyed about these potatoes is that they were great to make ahead. I baked the potatoes a day before, cooled and then scooped out the insides. I made the sour cream and chives potato mixture, filled the potato halves and then wrapped them up to bake up later. Another great thing about this recipe is you can pretty much stir in additional ingredients like cheese, crumbled cooked bacon, scallions, etc... the sky's the limit! 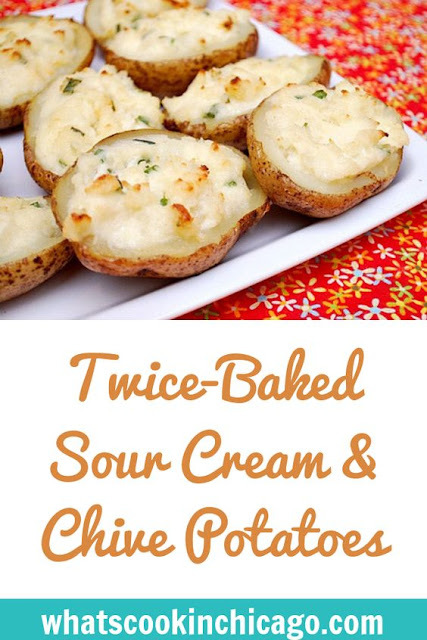 So if you're getting tired of the same old mashed potatoes, try making these ahead of time and with your own spin! Preheat oven to 400 degrees. Rub potatoes with vegetable oil. 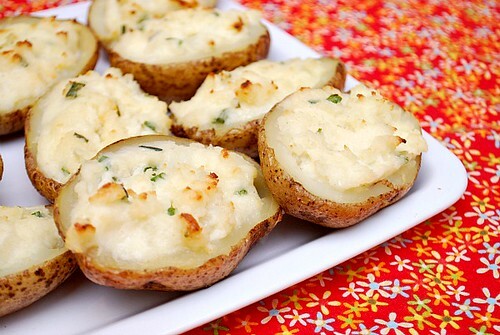 On a baking sheet, bake until potatoes are easily pierced with a paring knife, about 45 minutes. Let cool slightly. With paring knife, cut a thin slice lengthwise off the top of each potato and discard. Using a spoon, scoop out all but 1/2-inch potato flesh from inside skin. Transfer to a bowl and add sour cream, milk, butter, and chives; mash until combined. Season with coarse salt and ground pepper. Spoon mixture into potato skins. Bake until lightly browned on top, 20 minutes. Serve sprinkled with more chives.